Ever wanted to know what the Classifieds Section of the newspaper looks like in a Galaxy Far, Far Away? 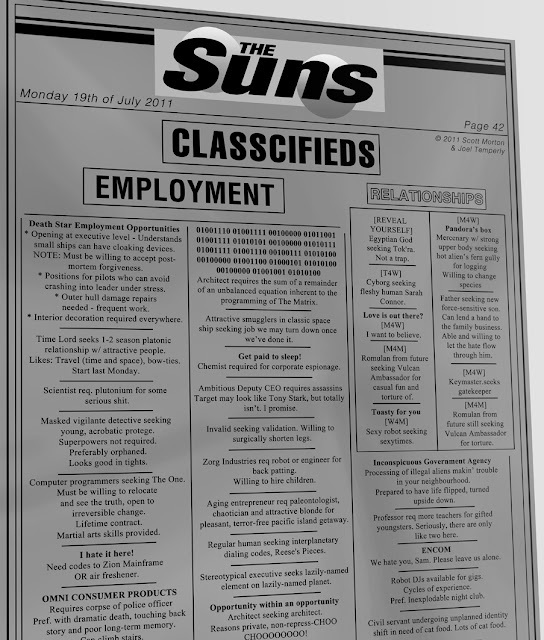 Now you do, thanks to Scott Morton and Joel, who've collaborated to bring you a glimpse at Tatooine's Premiere Newspaper, The Suns. A delicious Dark Side cookie to anyone who gets all of the many Sci-Fi references without cheating. Oh God, I got them all. I need a life! YES! I lastly discovered this site! I've been looking due to this post for so long!! In addition, they were cleaning up the second runescape money batch of illegal games.